Gallstones affect about 10 percent of the population, according to Johns Hopkins Medicine. Most people with gallstones don't even know they have them because they do not cause any problems. You can eat salads and greens with gallstones. If you are experiencing problems with your gallbladder because of the gallstones, you may need be careful with your choice of salad dressing. Gallstones are pebble-like substances that sometimes form in your gallbladder. Your gallbladder is an organ that sits below your liver, and collects, concentrates and stores bile, a substance that helps you digest fat. Gallstones form when the liquid bile hardens. Bile consists of cholesterol, bilirubin, bile salts, fat and protein. If your bile contains high amounts of cholesterol, bilirubin or bile salts your bile is more likely to harden and form gallstones. Gallstones vary in size, ranging from the size of a grain of sand to a golf ball. Doctors do not know why gallstones form. It has been theorized that it may be because your gallbladder does not completely empty or empty often enough. Certain disease-states also tend to increase your risk, such as liver disease and sickle cell anemia. Women tend to get gallstones more often than men. High amounts of estrogen during pregnancy or hormone replacement therapy increase the concentration of cholesterol in bile. Carrying too much weight and eating a diet high in fat and cholesterol and low in fiber also increases your risk of gallstone. Losing weight too quickly also increases your risk. Family history also increases your risk. Diet cannot prevent the formation of gallstones, according to the author of "Krause's Food, Nutrition and Diet Therapy." But if a high-fat, low-fiber diet increases your risk of developing gallstones, you may decrease your risk by limiting your fat intake and including more fiber-rich foods. Salad and greens are low in fat and high in fiber. 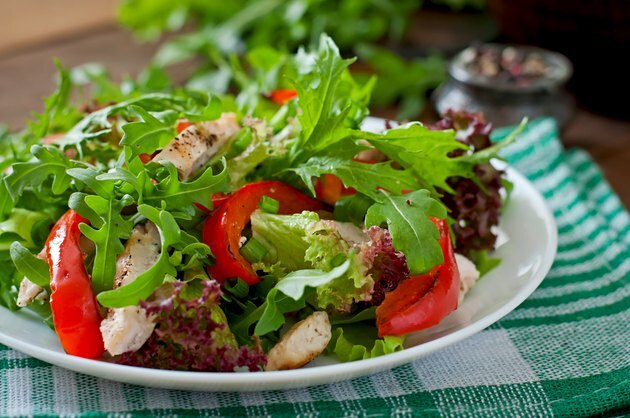 Salad and greens are also low-energy dense foods, meaning they have a low-calorie content compared to its serving size, which can aid in calorie control for weight management. While you do not need to follow a special diet when you have gallstones, if your gallstones are causing problems, such as inflammation of the gallbladder, your doctor may suggest you follow a low-fat diet. Limiting your fat intake decreases gallbladder contractions, which aids in pain control. Fat intake may be limited to 40 to 45 grams a day. Avoiding fried foods, and added fats, including high-fat salad dressings on your salad, are necessary to limit your total fat intake.